What Do Rihanna, Nicki Minaj & Usain Bolt Have In Common With Invest Caribbean Now 2013? CaribPR Wire, NEW YORK, NY, Fri. April 12, 2013: The Caribbean’s region’s diverse investment options go way beyond its talents like Barbados-born Rihanna, Jamaica’s Usain Bolt and Trinidad & Tobago’s Nicki Minaj. Those options will be up for discussion when Premier of the Turks & Caicos Islands as well as over a dozen other Caribbean ministers of governments gather for the international investment forum, Avalon Invest Caribbean Now 2013, (ICN 2013), on June 5th at the Radisson Martinique in New York City. “Contrary to popular opinion, the Caribbean region is not just a vacation destination but a region that is rich in its diversity of investment opportunities and talent, like we have seen in Rihanna, Usain and Nicki among others,” commented Invest Caribbean Now organizers. Invest Caribbean Now is presented annually by The Caribbean Tourism Organization; digital media solutions company, Hard Beat Communications and One Caribbean Television, during Caribbean Week in New York, which falls during Caribbean American Heritage Month in the United States. Limited partnership opportunities are still available by contacting Joe Bernstein at joe@investcaribbeannow.com or logging on to ICN’s brand new website at Investcaribbeannow.com. Partners for ICN 2013 are: Avalon Partners, One Caribbean Television, The PR Newswire, CaribPR Wire, News Americas Now, Caribbean Lifestyle Communications of Trinidad, WINN FM of St. Kitts, South Florida Caribbean, Caribseek, Antigua Tribune, Bahamas Spectator, Barbados Gazette, British Caribbean News, Caribbean ET Roundup, Caribbean Financials, Cuba Chronicle, Dominica Gazette, Dominican Republic Post, Dutch Caribbean News, French Caribbean News, Grenada Chronicle, Guyana Inquirer, Haiti Gazette, Jamaica Inquirer, Puerto Rico Tribune, St. Kitts Gazette, St. Lucia Chronicle, St. Vincent Tribune, Trinidad Tribune, the Bajan Reporter and The Bahamas Weekly. Carib PR Wire, NEW YORK, NY, Fri. May 11, 2012: Reiterating its commitment to the Caribbean region, One Caribbean Television returns this June as a partner of the 2012 Invest Caribbean Now Power Forum. OCTV, which jumped on board to help present the inaugural forum last June, has again signed on to the second annual Caribbean Tourism Organization and Hard Beat Communications investment forum, slated for June 6, 2012 at the New York Marriott Marquis in New York City. One Caribbean Television (OCTV) started off as a Caribbean Weather Channel, serving the Caribbean, Latin, Central and South America with current conditions and severe weather, tropical storm and hurricane coverage. That platform has been rapidly expanding to News, Business Reports, Sports Reports, Entertainment and Local Events as well as reports from correspondents on the islands and reports from New York City, Washington, D.C. and Puerto Rico. Our goal is to provide as much Caribbean content as possible and to continue to provide our viewers the quality programming that they deserve. OCTV is expanding its cable penetration in the Caribbean, Latin, Central and South America and is projecting its launch in the US and Canadian markets! The Invest Caribbean Now Power Forum is done in collaboration with the Caribbean Tourism Organization to educate the private sector on Wall Street of the hot Caribbean market as well and boost interest in investment opportunities in the Caribbean and its Diaspora. This year’s panelists are Chairman of Blue Equity, Jonathan Blue; President and co-founder of Solamon Energy Corp, Jay Yeo, Hon. Chairman of the Caribbean Tourism Organization & Minister of Tourism & International Transport Government of St. Kitts & Nevis, Ricky Skerritt and Lisa Lake, the chief development director of the Branson Centre of Entrepreneurship – Caribbean. The 2012 Leadership Award recipient is Sir Richard Branson, founder of Virgin Group. Invest Caribbean Now returns for a second year as Chinese investment in the Caribbean continues to boom in this free trade region that is politically stable and boosts attractive tax incentives, a highly literate work force and an established tourism market, and which the International Monetary Fund and World Bank forecast will see a 3.5 percent growth into 2013, higher than those of Eastern Europe and Central Asia, and similar to those of East Asia. Invest Caribbean Now 2012 sponsors include La Chambre Consulaire Interprofessionnelle de Saint-Martin, (CCISM) and One Caribbean Television while supporting sponsors are the PR Newswire, WSEE TV, CaribPR Wire, News Americas Now, Damoola Inc., The Museum of American Finance and The Affiliated Lawyers of the Americas. 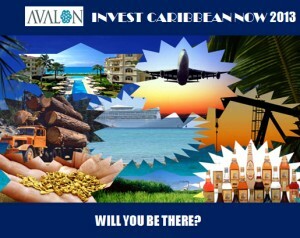 Additional information on the event can be found at InvestCaribbeanNow.com, the event’s pages on Facebook at http://www.facebook.com/people/Invest-Caribbean/100002110419705 and on Twitter at http://twitter.com/InvestingCarib. Invest Caribbean Now 2012 sponsors also include La Chambre Consulaire Interprofessionnelle de Saint-Martin, (CCISM), the PR Newswire, CaribPR Wire, News Americas Now, Damoola Inc and The Affiliated Lawyers of the Americas (”ALTA“) and the Museum of American Finance. For additional partnership opportunities email Joe Bernstein at joe@investcaribbeannow.com or log on to the sponsorship section of investcaribbeannow.com. That’s the advice from W. Dave Dowrich, vice president of investment at Goldman Sachs and the keynote speaker at the inaugural Invest Caribbean Power Forum, convened by digital media solutions company, Hard Beat Communications and the Caribbean Tourism Organization in New York City on Thursday, June 9, 2011. Dowrich, addressing a packed room at the New York Marriot Marquis Hotel in Times Square, insisted that the Caribbean’s investment “product” stacks up against most other regions of the world, including the BRICS (Brazil, Russia, India and China) on several fronts, such as political stability, accessibility and ease of doing business. But “where we fall down is in selling and telling our investment story, i.e. the ‘Promotion – P’ of the principles of marketing,” he said of the CARICOM region, whose combined Gross Domestic Product is put at US$90 billion. Comparing the Caribbean to private companies going public and the need to ensure that their story continues being told to their existing and future investor base, Dowrich said the Caribbean and its leaders must see investment in a similar vein. “We therefore need to be sure that at every opportunity, our story is told on a consistent basis and told by credible and trust worthy folks such as our senior ministers, and then reinforced by our teams on the ground, who can ‘talk the talk’ of those that need to hear it,” he said. Dowrich was one of four speakers who addressed the event yesterday. 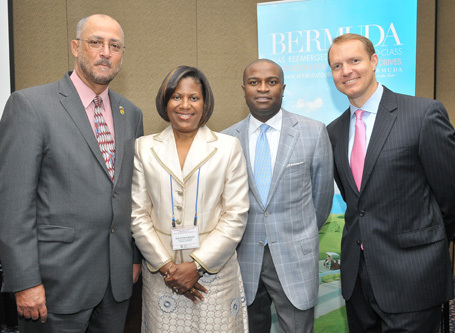 Others included Minister of Business Development & Tourism of Bermuda, Patrice Kimberly Minors; Martin Mohabeer, the Guyana-born Managing Director of Spackman Group and CEO of Spackman Capital and David Brillembourg, CEO of the Brilla Group. Minors for her part insisted that Bermuda remains open to doing business while Brillembourg advised that attention be turned to Latin American pension funds as potential investors in the Caribbean region. “With this fund we hope to change that,” said Mohabeer, while adding that the fund will make investments in small to middle enterprise firms specializing in IT, media and technology and construction among other sectors. Among the over 120 attendees at the event were several money managers from the New York’s investment community as well as top tourism officials from the Caribbean including the Hon. Chairman of the Caribbean Tourism Organization and Minister of Tourism and International Travel for St. Kitts/Nevis, Ricky Skerritt; Hon. Richard Sealy, Minister of Tourism, Barbados; Hon. Ed Bartlett, Minister of Tourism, Jamaica; Commissioner of Tourism of St. Eustacius, Clyde Van Putten; Secretary General of the Caribbean Tourism Organization, Hugh Riley; Sylma Brown Bramble, director of CTO North America; Alec Sanguinetti, Director General of the Caribbean Hotel and Tourism Association, Josef Forstmayr, President, Caribbean Hotel and Tourism Association, and other top CTO officials as well as Caribbean directors of tourism. “The Caribbean Tourism Organization was proud to team up with Hard Beat to present this event, since in these tough economic times, investment in the Caribbean is critical and the CTO believes strongly in continuing to boost the tourism sector of this vibrant region by presenting investment opportunities for its members,” commented Brown-Bramble. Additional sponsors included the PR Newswire, CaribPR Wire, The Bahamas Weekly, News Americas Now and the Caribbean American Chamber of Industry and Commerce. Hard Beat Communications brands itself as a Digital Media Solutions Company. The company does this through its Digital Content Creation and Dissemination and syndicated digital newswire – New Americas Now, formerly CaribWorldNews, its CaribPR wire release dissemination section, part of the PR Newswire; its Media Buying and Event Promotions arm and its New Media Solutions department. The Caribbean Tourism Organization exists to increase significantly the inclusion of the Caribbean region in the set of destinations being considered by travelers. The CTO, with headquarters in Barbados, comprises 32 member countries, including English, French, Spanish and Dutch countries and territories, as well as private sector allied members. Every year, the CTO presents “Caribbean Week In New York,” which Caribbean Week in New York is a celebration of the sights, sounds, colors, culture and unique vacation attributes of the Caribbean.